Audience gathers for the LIYH Spring Recital (2 p.m.). Photo by Joshua Diltz. from Portage Bay through that waterway into Lake Washington. That afternoon, Justify won the Kentucky Derby at Churchill Downs in Louisville, Kentucky (“Bourbon City”). And it was Cinco de Mayo (Fifth of May), celebrating Mexico’s victory over France at the Battle of Puebla in 1862, during the U.S. Civil War. All this was important, of course, but in Seattle, the most important event of the day happened—at least for some 65 young musicians and almost 200 audience members, including me—the Spring Recital of Lessons In Your Home (LIYH) at Woodland Park Presbyterian Church in the Phinney Ridge neighborhood. The recital was so large that there were two sessions, one at 2 p.m. and the other at 4 p.m. In the 2 p.m. recital session, there were 22 pianists, six guitarists, two vocalists, and one trumpeter—Ferin, my 39th private student (see blog post of 18 November 2017, using the Archives in left column). He played “The Snake Charmer,” a traditional song, and nailed it! Perfect. His parents and I are so proud of him. Here’s a video, taken by Shilo Jones, of his performance: https://drive.google.com/file/d/1Nw_zQxkVsXfEzPTuIxT7IgYS5AH3kRHZ/view?usp=sharing. LIYH is an online school of music that is based in Atlanta, Georgia. It offers carefully selected teachers who will come to your home for private music lessons in major cities, including Atlanta, Seattle, Denver, Houston, Dallas, Washington, D.C., Baltimore, Orlando, and Miami/South Florida. In some areas, lessons are taught at the students’ local schools. Scott D’Angelo is the excellent LIYH Seattle Director. At present, I have three trumpet students brought to me by LIYH. Please see http://www.lessonsinyourhome.net. The two photos above are courtesy of Lessons In Your Home and were taken by Joshua Diltz. I took the four below. Please click on any photo to enlarge it. 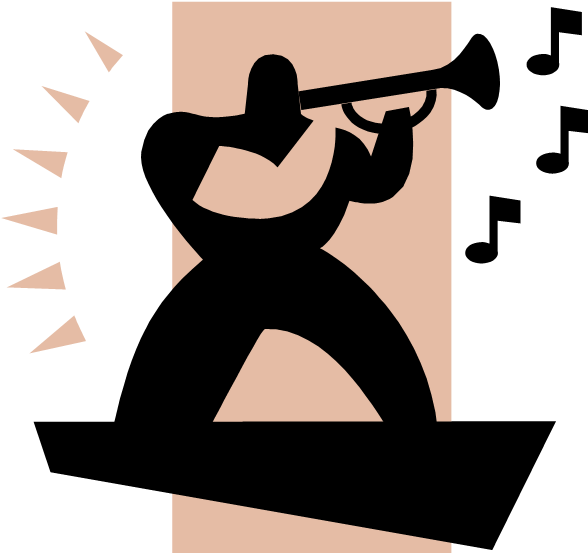 Three students performed at the 7th Annual Trumpet Recital in our home in Edmonds on 18 June, and three more were unable to attend. Of the performers, two are going into 8th grade next fall, and one is going into 9th grade. One began private trumpet lessons with me in December 2013, another in September 2014, and the third in February 2016. Selections included music by Elton John, Tim Rice, John Lennon, Paul McCartney, John Williams, Pat Ballard, Francoise Couperin, and John Kander. Popular pieces were Hedwig’s Theme, Cabaret, and When I’m 64. After the performances, I gave a brief clinic and demonstration of the Herald Trumpet, English Bugle, Getzen Field Trumpet, Cornet, and Trumpet, so that the parents, relatives and friends in the audience could better appreciate the history and complexity of these instruments, as well as the difficulties which students must learn to control in order to master them. Refreshments were served after the recital. There were eight of us music teachers present—we’re all part of the LIYH staff, and I’m one of the trumpet tutors among the Seattle group. LIYH is led by Jay Maurice of Atlanta, GA, who founded it in 1997. Jay emceed the Sunday afternoon recital. Today, he operates his business in nine cities, including Seattle, Denver, Dallas, Houston, Washington, D.C., Baltimore, Orlando, Miami/South Florida, and Atlanta. Lessons in Your Home has more than 250 teachers nationwide, teaching music to more than 1,000 students in their own homes. Jay personally interviewed and selected us teachers. See http://www.lessonsinyourhome.net. Three high-schoolers and one middle-schooler showed off their talents and abilities at the 4th Annual Trumpet Recital by my students in my home in Edmonds on 8 June. Bands at Inglemoor (Kenmore), Bothell, and Juanita (Kirkland) high schools and Hamilton International Middle School (Seattle) get the benefits of their musicianship. Private lessons make a big difference in their performance at school. Erik played “Chiapanecas,” “In a French Cafe,” and two bugle calls, “Assembly” and “Fire Alarm.” Robert played “Centaurus,” “The Technician,” and the bugle call, “Tattoo.” Vaughan played “The Executant,” “Bird’s Backyard” (jazz), and the bugle call, “Mess.” Sarah played an original composition (untitled) and “In Dreams” from the movie, The Lord of the Rings. 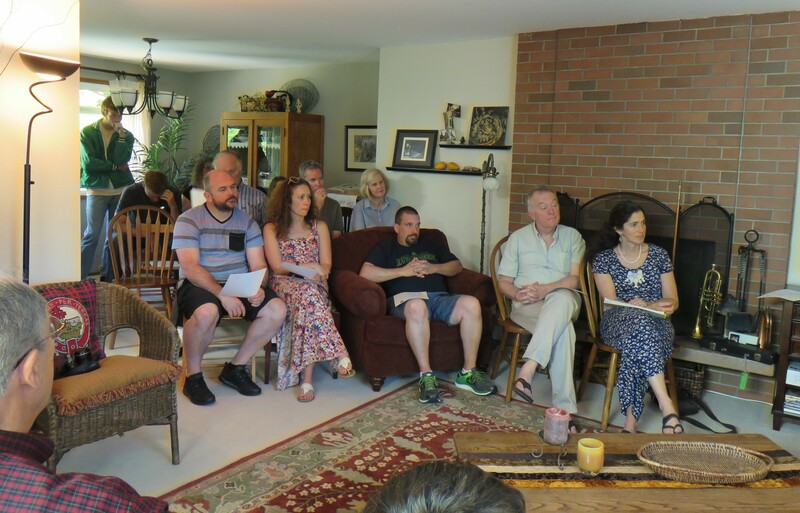 About 40 guests from the Greater Seattle area came to the home of their favorite tutor (me) in Edmonds on Saturday, 9 June, to the 3rd annual trumpet recital featuring my 9 current students. They take lessons from me in their own homes once a week. Eight attend the following schools: Lawton, Crystal Springs, and Tukwila elementary schools; Kamiakin, Kenmore and Skyview junior highs; and Eckstein Middle School. Of these, four students are moving up to Nathan Hale, Inglemoor, and Juanita high schools in the fall. There was a morning and an afternoon session, and each student played two pieces. Refreshments were served after the performances. Most of the music selections come from musicals, movies, the Beatles, and patriotic compositions. Here is a gallery of photos. Please click on any photo to enlarge it. Five students came to the morning session, four to the afternoon one. Students in morning session bow amid thunderous applause! On 11 June, my trumpet students brought their horns, music, parents, relatives and friends to my home for the second annual trumpet recital. 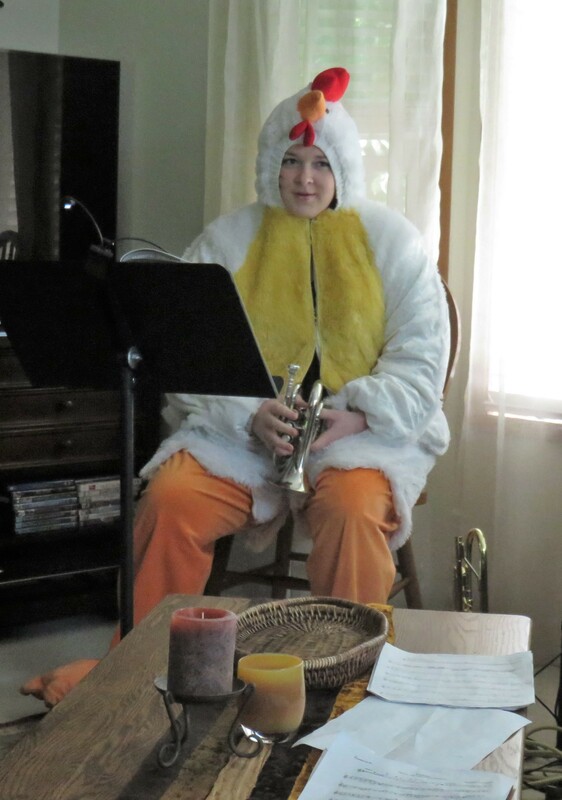 Eight of my 9 players were scheduled to play their various solos, four trumpeters in the morning and four in the afternoon. Some of the tunes came from musicals and movies, including “I Whistle a Happy Tune” (from The King and I); “Do-Re-Mi” (from The Sound of Music); “Chim Chim Cher-ee” (from Mary Poppins); and “Pirates of the Caribbean” (from the movie of the same name).